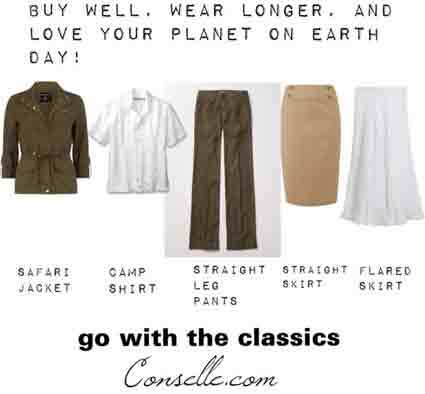 Judith Rasband tells us to cut down on our clothes buying, to celebrate Earth Day (which was Monday 22 April). Here’s the basic capsule of classics she thinks we should be choosing instead of high fashion. Oddly, Judith Rasband doesn’t mention making new clothes from old ones. Much done by all the people who love turning pre-owned clothes into something else. The goddess of this is Marisa of New dress a day, and her book with the same name. Or see Cloth magazine. Or here are more book suggestions from an enthusiast. As I was a small child in WWII, when children’s clothes were made out of the not-too-badly-worn sections of adult clothes, this is the first thing that comes to mind for me when re-cycling clothes is mentioned. As Judith Rasband’s choices are classics, there are dozens of possible patterns. 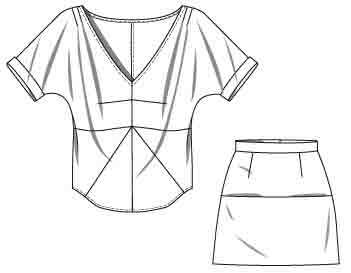 Here are some easy makes for beginners, and supremely elegant designer versions needing advanced skills. Go for high quality and use Claire Shaeffer Vogue 8732. For a much simpler make, there’s Kwik Sew 3534. Also see my post on jackets with many pockets. Choose your pocket locations with care ! If your upper-lower body proportions are not balanced, you may look better in a 2-pocket style – on your hips if you’re upper body dominant, above your waist if you’re a pear shape. A safari jacket is the casual jacket Judith Rasband tends to go for. If you like something a bit softer, I think a drape front jacket is now a casual classic. Imogen Lamport has a post on choosing your cardigan jacket to flatter your body shape. For other casual possibilities, see my post on choices for the jacket in a basic casual capsule. Let’s go simple rather than designer, for ease of making, and choose Kwik Sew Kwik Start beginner patterns. Kwik Sew Kwik Start 3475 is a basic camp shirt. 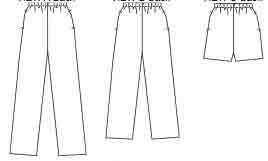 Kwik Sew Kwik Start 3314 straight leg pants have an elastic waist. If you’d prefer elegant designer versions, how about a couple of patterns by Chado Ralph Rucci. Change the length a bit to layer under Claire Shaeffer’s safari jacket. Or use Chado Ralph Rucci’s Vogue 1347 shirt jacket. Kwik Sew Kwik Start patterns for speed and simplicity again. Kwik Sew Kwik Start 3765 is a straight skirt with elastic waist. 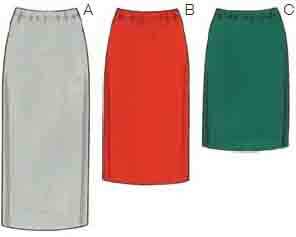 Kwik Sew Kwik Start 2806 is a flared skirt with elastic waist. 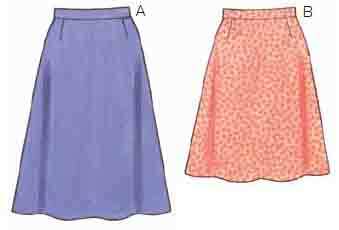 If you prefer a fitted waist, Kwik Sew Kwik Start 3877 is an a-line skirt with darts, zip, waistband. and McCall’s 3341 for an a-line skirt. The flared skirt illustrated by Judith Rasband is a designer skirt with horizontal pin tuck detail round the hem. 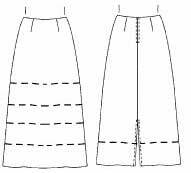 No need to go for the detailing, but if you’d like some designer elegance for your skirts, there are plenty of straight skirts among the designer co-ordinates at Vogue patterns. Currently only one flared skirt designer pattern – lengthen the skirt from Rachel Comey in Vogue 1247. From Chado Ralph Rucci there’s a bias cut straight skirt, Vogue 1310. And some dresses it’s possible to take a flared skirt pattern from – Chado Ralph Rucci at Vogue. 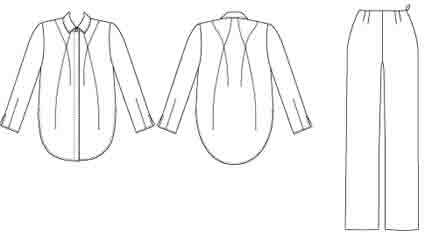 I’ve chosen specific patterns needing easy and couture sewing skills. 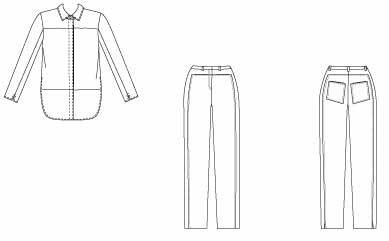 Of course there are many other ways of picking the styles for a basic group of jacket/ top/ pants/ straight and full skirts. How about the wardrobe pattern book ‘Dressmaking’ by Alison Smith for intermediate sewing skills (making ultra-conservative styles). Then the wardrobe pattern Vogue 6701 has a jacket a bit more advanced than Alison Smith’s (separate the dress into peplum top and flared skirt). 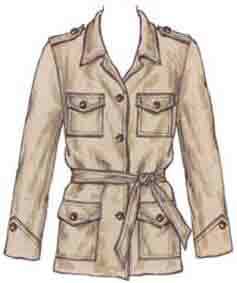 styleARC (what they call a safari jacket doesn’t have the 4-pocket style). Judith Rasband suggested a simple 5-item capsule which can be business/ casual/ dressy, depending on colour, fabric, accessories. Though I would want more than one top. I’d make several shirts, other people might prefer knits ! Well, I’m not sure we would all be at our happiest when wearing ultra-classic styles. And I don’t agree that it’s only ultra-classic styles that are wearable for many seasons. Fortunately, we haven’t got to choose either ultra-classics or new-each-week ultra-fashion. There are many other styles which last for more than one season. Even ultra-classics can’t always be worn for many decades, as proportions and details change. Here’s YouLookFab on using a few classic items with others. Make several versions of this capsule on your way from an easy starter-wardrobe to a big challenge ! This entry was posted on April 27, 2013 at 10:07 am and is filed under specific capsules. You can subscribe via RSS 2.0 feed to this post's comments. Both comments and pings are currently closed. I love and appreciate the thoughtfulness and research you bring to your blog entries. As for a long-lived classic, the kimono jacket is one of my favorites. It can be loose and flowy, or more structured and close to the body (but not fitted) and when one wants to make the fabric into something else, there are large pieces to work with. Here’s my post on patterns in kimono style. YouLookFab has a good post on modern versions of the kimono. I’m in awe of how you find all your pattern examples. When I was a girl, I only had access to the major companies and I guess I was eager to see what they came up with in each new pattern book. And I thought in terms of what was new that caught my fancy rather than deciding for myself what I might prefer. Now that I have begun sewing again, I am having the devil of a time trying to locate patterns by *feature*. I don’t know how people do it! Yes Vildy, those wide sleeves are current – but it is important to get the proportions right for our body shape. There’s no big secret about how I find the patterns – I just enjoy going through the catalogues (and as I’m interested in patterns I have quite a good memory for them). The reason I mainly show BMV patterns is because their on-line catalogues are the quickest to use. 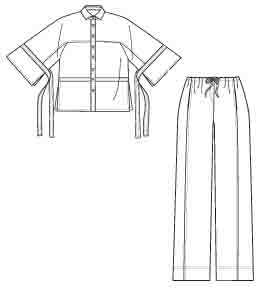 Simplicity-Burda, you have to do a separate click-wait to see the line diagram and yet another to see the fabric-notions. Simplicity has tops/ jackets/ coats all jumbled together – not worth the bother. And most independents you can’t get straight from one pattern to another, you have to go back to a master list every time. BMV are the only catalogues which don’t annoy me and waste my time by requiring a whole lot of extra steps to access them !